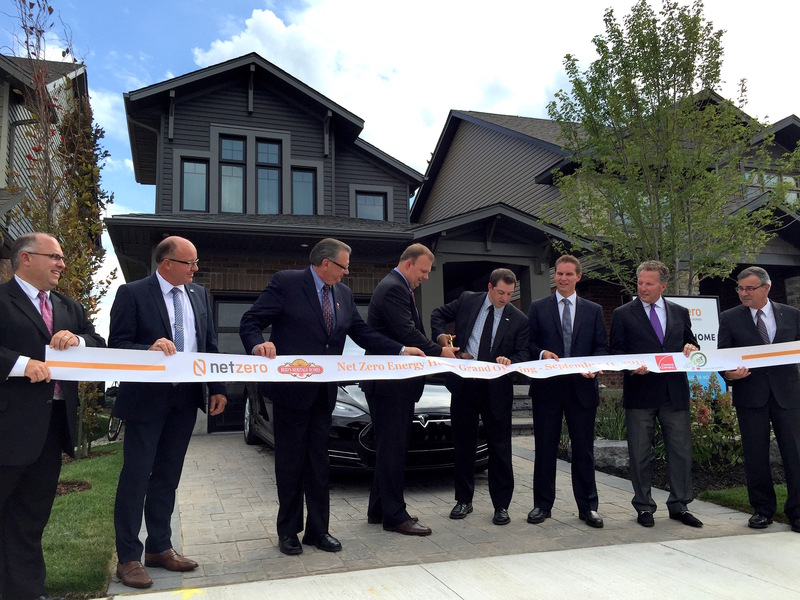 (September 11, 2015, Guelph, ON) Canada’s newest Net Zero Energy home has been built in Guelph. Constructed by Reid’s Heritage Homes, the house is the first completed as part of a national demonstration project to prove that Net Zero homes can be built on a community-level scale. The goal is to make Net Zero Energy homes--which produce as much energy as they consume on an annual basis--fully accessible and affordable to all Canadians. Reid’s Heritage Homes is building five homes as part of this project. Overall, five builders were selected to participate in the national project that will see the construction of at least 25 Net Zero Energy homes in four provinces--Nova Scotia, Québec, Alberta, and Ontario. This total will almost double the amount of Net Zero Energy homes currently in Canada. Unlike other custom Net Zero homes that have been built across Canada in previous years, this project will utilize existing technology and products that are readily available to the average builder. The back roof tells a different story. The 33 solar photovoltaic (PV) panels from Bluewater Energy are a more obvious sign of the innovative technology being implemented in this project. The PV panels will produce the energy required for the home to achieve Net Zero Energy status. More importantly, the technologies underneath the façade are what make this Net Zero Energy home innovative and affordable. One of the critical technologies is the insulated and airtight design providing an advanced envelope system made possible by the Owens Corning™ CodeBord® Air Barrier system, which significantly reduces air leakage of the home. The homes have triple pane windows by JELD-WEN Windows, for enhanced comfort and insulation while providing noise reduction. The home incorporates the latest air source heat pump space heating technology from Mitsubishi Electric and a leading-edge hybrid air source heat pump hot water tank from Rheem Canada. 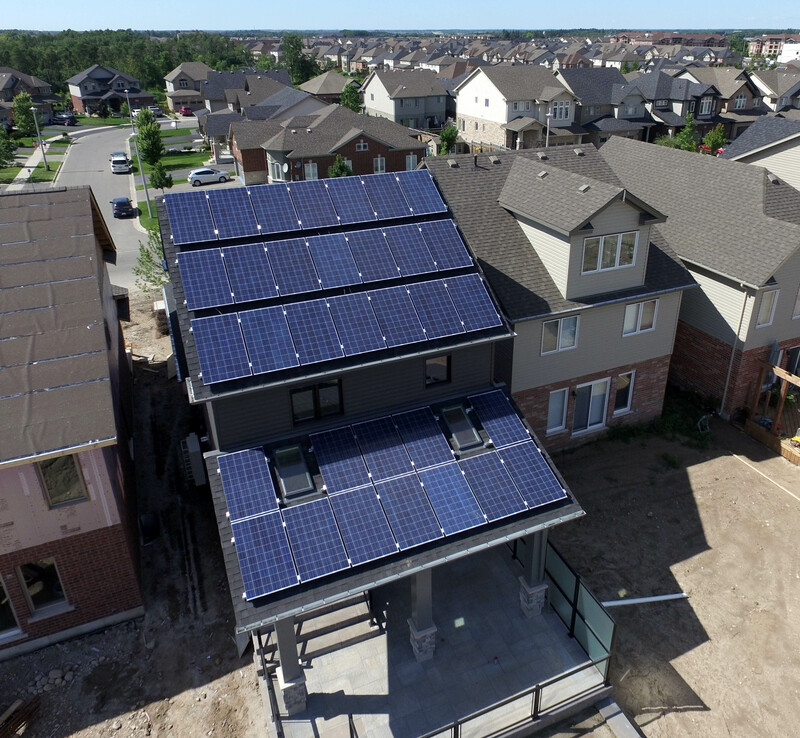 Built in the Westminster Woods community of Guelph, Ontario, the project’s inaugural home will be used as a show house for the remaining four Net Zero Energy homes to be built by Reid’s Heritage Homes. The second home is already for sale while the remaining three will be completed by spring of 2016. Tesla Motors was also present at the event promoting their electric vehicles, charging stations and their new Powerwall battery storage. Reid’s Heritage Homes intends to offer the Tesla Energy Powerwall battery to its homebuyers once it becomes available in Canada. The public is invited to attend the public grand opening on Saturday, September 19, 2015 from 10 am to 5 pm and tour the home. Prizes will be given out to the first 100 people who register and attend the grand opening. For more information and to register, visit www.LiveNetZero.com. High quality digital images are available upon request. A modern approach to traditional homebuilding. Built on a solid reputation of quality, integrity and service, Reid’s Heritage Homes is one of Ontario’s leading builders, with a history of homebuilding that dates back to 1947. The same enduring values that motivated our founder, Orin Reid, inspire our many diverse communities today. Our commitment to these values applies across the Reid’s Heritage Homes’ family of companies, including Williamsburg Homes with a community in Kitchener, and Sherwood Homes, with communities in Collingwood. Owens Corning (NYSE: OC) develops, manufactures and markets insulation, roofing and fiberglass composites. Global in scope and human in scale, the company’s market-leading businesses use their deep expertise in materials, manufacturing and building science to develop products and systems that save energy and improve comfort in commercial and residential buildings. Through its glass reinforcements business, the company makes thousands of products lighter, stronger and more durable. Ultimately, Owens Corning people and products make the world a better place. Based in Toledo, Ohio, Owens Corning employs about 15,000 people in 26 countries. It has been a Fortune 500® company for 61 consecutive years. For more information, please visit www.owenscorning.com. For more information about the ecoEII Net Zero project, go to www.zeroenergy.ca.